Niner has played a big part in the wheel size innovation movement of mountain biking. To them, it's not about a larger wheel size or more accommodating geometry, it's about sharing an entirely unique experience on two wheels. Since they began in a humble Fort Collins, Co office, Niner has focused intently on building the rowdiest and most innovative big-wheeled bikes on the market. Their RIP 9 series prides itself on a meticulously designed Aluminum frame. In the process of designing this frame, Niner has revolutionized the way a long-travel, large-wheeled bike performs. The rear suspension is remarkably versatile, counteracting squat and bob to absorb shock without stealing from your pedal stroke. With short chainstays and a low bottom bracket, this bike is remarkably fun for a 29'er. I had wanted this frame since I first saw it. Finally pulled the trigger on it when I saw it in the size I wanted for a price I was happy to pay. I love this frame. Coming from a Kona Process 111DL frame which I really enjoyed, I am very happy with my change. It pedals better than the Kona did...and I tried 3 different shocks and a number of different sag settings on it during my time with the bike (don't get me wrong, I loved that bike...just wanted something...better). It seems just more solid when you're pedaling...no bobbing up and down. This could be a function of the DebonAir shock or the overall suspension setup. Climbing is also better than the Kona...I feel like I can easily climb hills that I would previously have difficulty with. I love the travel...sure it's probably way more than I need for the XC/AM riding I do, but it's really nice to be able to ride a bike that doesn't feel harsh during big hits and allows my 39 year old self to bomb over things feeling confident. The cockpit of this bike feels a bit shorter than the Kona while having a longer wheelbase. I know they're really different bikes, but for me I actually like the slightly more upright positioning with the longer wheelbase. Feels more stable and confident overall. I will say that the Kona is a tad better in quick, twitchy sections of the same trail, but the Niner just feels so much more confident overall on the parts that are more difficult. The finish on the bike is poweder coated and feels very durable. I prefer this greatly to the painted finishes on a lot of bikes I have owned. My overall build uses a Diamond DVO fork, e.13 TRSr cranks with OneUp pedals, GX Eagle derailleur and cassette powered by an Archer Components D1x unit, Guide RS brakes, Descendant Stem holding Spank Vibrocore bars, sitting on my own built wheelset based on Pro2Evo hubs and Stans 30mm internal rims and Maxxis tires. Niner RIP 9. Absolutely love this bike. Hey Bill, Thanks for the great review! We are stoked that you love the frame, Keep Pedaling! Great frame. I had the previous generation WFO and really liked it so I bought this frame and spec'd it to my liking. 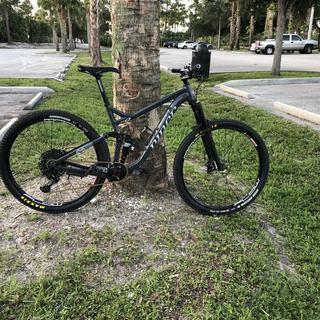 It has a modern geometry and works really well with a two position fork like the Rockshox Pike or Lyrik 130/160, which makes it climb more efficiently in the 130 setting. I'm really happy with the purchase and feel good taking this bike anywhere. Has anyone set this up with 27.5” x 3” wheels ? If so, what size fork you used and how do you find the ride ? anyone run a coil shock on one of these? BEST ANSWER: I have a Fox DHX2 on mine right now. Night and day compared to the Rockshox shock. Only have about 5 or 6 rides on it, but I'm really liking it so far. Really plush without losing pedaling ability. Can this RIP9 be set up 2x? BEST ANSWER: I would have to say no. It's designed for a 1x. I currently run a 1x using a 34t oval chainring combined with a SRAM Eagle drivetrain. I don't feel like I've ever been at a loss for gearing using this. does this frame come with HEADSET BEARINGS ? BEST ANSWER: Yes. It comes with a complete Niner headset with star nut, top cap, and spacers.